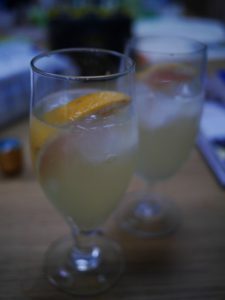 The IBA’s standard recipe is 6:3:1.5 champagne to gin to lemon juice, with a couple of dashes of sugar syrup. 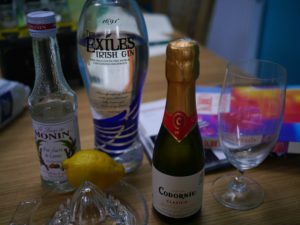 Cross’s Classic 1000 Cocktails halves the gin and uses a teaspoon of caster sugar. Ideally the garnish should be a maraschino cherry but I was out of those. 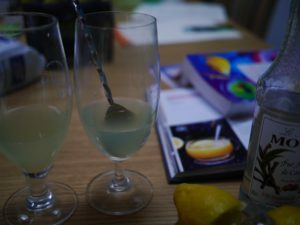 Combine the gin, juice and sugar in a glass and mix with a bar spoon. Then just add ice and top off with sparkling wine and garnish.